A peptic ulcer is a sore or raw area in the lining of the stomach. It also can occur near the top of the small intestine. This area is called the duodenum. The lining is damaged by the acids your body uses to digest food. The most common symptom is a burning pain in your stomach. It usually lasts for a few minutes to a few hours. It comes and goes for days or weeks at a time. The burning typically occurs between meals and at night. Small ulcers may cause no symptoms. The main cause is the bacterial infection, Helicobacter pylori (H. pylori). Another common cause is long-term use of nonsteroidal anti-inflammatory drugs (NSAIDs). This includes aspirin, ibuprofen, and naproxen. In rare cases, it can be caused by cancerous and noncancerous tumors. A less common cause is a rare disorder called Zollinger-Ellison syndrome. Your doctor will do a physical exam. He or she will ask you questions about your medical history. Tell your doctor if you take aspirin, ibuprofen, or naproxen frequently. Your doctor will look for stomach bloating. He or she will listen to sounds in your stomach with a stethoscope. Your doctor will tap your stomach to check for pain. Your doctor may schedule a special procedure to look at your stomach. This is called an endoscopy. For this procedure, you’ll be given medicine to relax you. The medicine may make you fall asleep. The doctor will insert a thin, flexible tube down your throat. A tiny camera on the end of the tube displays the lining of your stomach and duodenum. The doctor may take a sample of your stomach lining (a biopsy). This is done to test for H. pylori. Blood, breath, and stool sample testing can also be used to check for H. pylori. 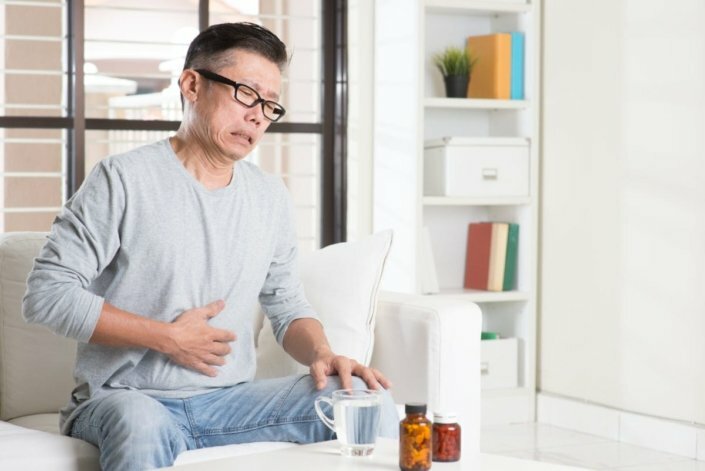 Can peptic ulcer disease be prevented or avoided? Stress and spicy foods do not cause ulcers. However, they can make them worse. Smoking and alcohol can cause a peptic ulcer. Men should limit alcohol to 2 drinks per day. Women should have no more than 1 drink per day. Talk to your doctor if you take aspirin, ibuprofen, or naproxen regularly. Your doctor may begin by prescribing medicine. Your doctor may suggest other treatments for other causes. If you have H. pylori, your doctor will treat the infection with “triple therapy.” This is a combination of 2 antibiotics and bismuth subsalicylate (Pepto-Bismol). H pylori can be stubborn. Take all your medicine as prescribed. Protein pump inhibitors. This includes esomeprazole (Nexium) or lansoprazole (Prevacid). Histamine receptor blockers. This includes famotidine (Pepcid) or ranitidine (Zantac). If NSAIDs cause your ulcer, you may need to stop or reduce the amount you take. You may need to switch to another type of medicine for pain. Most ulcers heal within about 8 weeks. Peptic ulcers come and go. You have to do what you can to reduce your risk. If you smoke or chew tobacco, ask your doctor about how to quit. Eat a well-balanced diet. Avoid foods that cause discomfort. These include alcohol, coffee, caffeinated soda, fatty foods, chocolate, and spicy foods. Avoid eating late at night. Talk to your doctor about alternatives to NSAIDs. Take all medicines with plenty of water. What other pain medicine can I take besides aspirin, ibuprofen, and naproxen?? Can I eat spicy food in small quantities? How did I get H. pylori? Can I get H. pylori again? Information about the causes, diagnosis and treatment of ulcers in your digestive tract.